Looking For a Car Body Repair Centre in Bournemouth? Malvern Body Repair Centre has been established for over 30 years, providing clients in Bournemouth and surrounding areas with a wide range of vehicle body repair services. Owned and run by experienced car body repair specialist Roger Tubb, Malvern Body Repair Centre provides services to both domestic and trade clients, combining superior workmanship with affordable prices. We have a proven track record of completing high quality, cost-effective vehicle body repair work, using the latest computerised colour mixing technology to achieve a perfect finish. Our number one priority is customer satisfaction, and we are extremely proud of the fantastic reputation we have gained in the area. 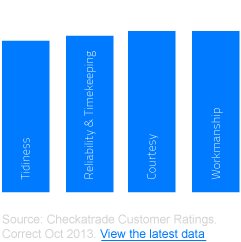 As longstanding members of Checkatrade we have received a large amount of feedback from our customers, achieving a near perfect average customer rating of 9.8/10. See the feedback for yourself by visiting our Checkatrade page.